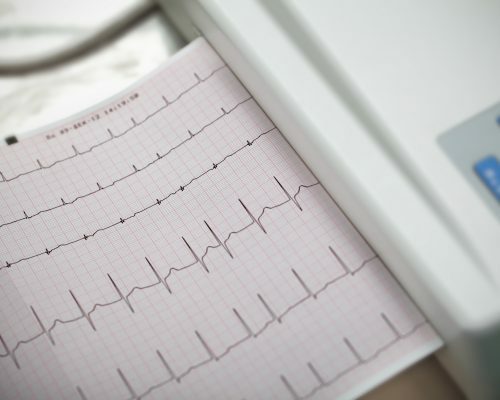 If you were to notice your heartbeat skipping and felt a thud or thump in your chest, followed by your heart racing, or if you were to feel your heart fluttering or jumping, this would not be normal – you could be experiencing what is known as atrial fibrillation. Atrial fibrillation is the most common form of heart arrhythmia. About 2.7 million Americans live with atrial fibrillation. Essentially, it means that the rhythm of the heart is off. During an arrhythmia, the heart can beat too fast, too slow, or with an irregular rhythm. Many sufferers will describe it as their “heart quivering”. A simple way to explain atrial fibrillation is by calling it a disconnection that takes place in the atria of the heart. The atria act as the heart’s collecting chambers that send blood in an efficient rhythm into the pumping chambers, called ventricles, by way of regular electrical signals. From there, blood is pumped to the rest of the body. If a person has atrial fibrillation, the electrical signals are fast, irregular, and often disorganized. When the signals are disorganized, the heart may not pump efficiently. The body may get small amounts of blood or sometimes it will receive larger amounts of blood. The amount will really depend on how much blood has flowed from the atria through to the ventricles with each beat. So what exactly causes this electrical malfunction? Studies are ongoing, but what is evident is that damage to the structure of the heart is one of the most common causes of atrial fibrillation. It isn’t the only source though. Atrial fibrillation has also been linked to high blood pressure, heart attacks, coronary artery disease, abnormal heart valves, heart defects, overactive thyroid gland, lung diseases, and previous heart surgery. There is even research that shows exposure to certain medications, caffeine, tobacco, and alcohol can cause atrial fibrillation symptoms. Heart specialists say Sick Sinus Syndrome is another potential cause. Sick Sinus is the improper functioning of the heart’s natural pacemaker. Atrial fibrillation causes continue to be the source of a great deal of medical research around the globe. Although experts can’t say for certain why, statistics show us that more men suffer from atrial fibrillation than women. We also know that the chance of getting this condition increases with age. This is because our risk of heart disease, as well as other ailments that can cause atrial fibrillation, increases as we get older. However, you don’t have to be a senior to be at risk. The U.S. Department of Health and Human Services says that half of the people who have atrial fibrillation are under the age of 75. Treatment of atrial fibrillation could include various medication, lifestyle changes, or specific medical procedures, such as surgery. Depending on the patient, the goals of atrial fibrillation treatment could be to regain normal heart rhythm, control heart rate, prevent blood clots, or reduce the risk of stroke. Estimates suggest that 15 percent of all strokes are caused by atrial fibrillation. During atrial fibrillation, the atria contract in a disorganized way and don’t move blood properly. This means the blood pools and gets stuck in the little grooves of the heart, which can result in blood clots. Blood clots can get pumped to the brain, causing stroke. Maintaining a healthy lifestyle is the key to overall good health, and much has been written about physical activity and the heart. Research suggests one hundred and 50 minutes of moderate exercise per week or 75 minutes of vigorous exercise per week can improve cardiovascular health. And many wonder about a connection between atrial fibrillation and exercise. Most experts say atrial fibrillation and exercise do mix. They still suggest that you discuss it with your doctor and that you build up your exercise gradually. Jumping into an exercise with high intensity could trigger atrial fibrillation symptoms. The best approach with atrial fibrillation and exercise is to start with five to 10 minutes a day and work up from there. Research suggests that over 50 percent of people who have experienced occasional atrial fibrillation symptoms point to stress as a trigger. A study published in the Journal of the American Heart Association back in 2008 found that patients with atrial fibrillation benefit from being aware of stress and taking specific strategies to deal with it. Strategies can include anything from taking a walk with your dog to enrolling in a yoga class to relieve stress. In 2012, the Journal of The Heart Rhythm Society published a study that showed the Chinese herbal extract, Wenxin Keli, is effective in suppressing atrial fibrillation. Wenxin Keli is, in fact, a mixture of Chinese herbs that has been getting considerable attention in the medical community. Since the 2012 report came out, other research has emerged suggesting Wenxin Keli could be beneficial in cases of cardiac inflammation and arrhythmias. As mentioned earlier, a healthy lifestyle is key, but recent studies also show supplements such as fish oil and taurine can go a long way in helping protect our hearts. When left untreated, atrial fibrillation can completely alter the quality of a person’s life. However, when people pay attention to the signs and symptoms, the triggers, as well as lifestyle habits and alternative treatments, they can live normal, active lives with atrial fibrillation.